We offer high grade Water Meters that are specifically designed keeping in mind the various parameters of quality and other related standards. Available in various types, single jet meter and Multi-jet meter, our Water meters render trouble free performance for a longer time period. Single jet meter uses only one port to create jet water whereas Multi-jet meter uses multiple ports to create jet of water against the turbine. 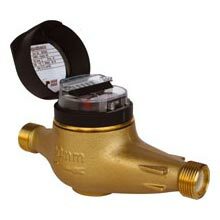 Multijet Type water meter is widely used in applications where small quantities need to be metered. Horizontal Woltmann Water Meter with large turn-down is used for accurate measurement of water distribution.